Ken Williams (Arapaho/Seneca) was born into the beadwork tradition. His early years were spent on his father's Seneca reservation in NY where he started observing and experimenting with beadwork. 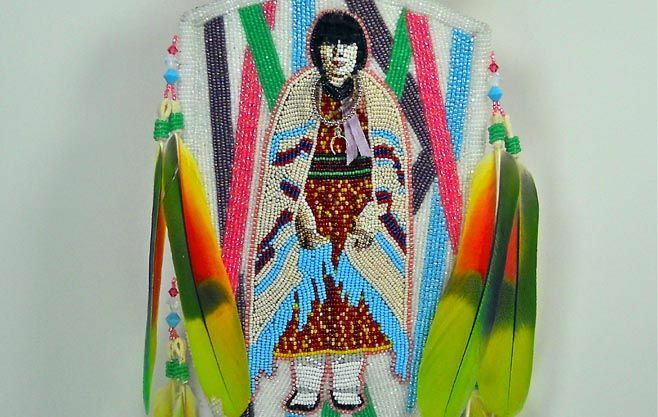 As a teenager, he spent time with his mother's family, master beadworkers themselves, at the Wind River Reservation in Wyoming. Here he began to take on bigger, more complex projects. While at IAIA, he was mentored by Teri Greeves and began to develop his own style which mixed a contemporary aesthetic with traditional beadwork. Ken now focuses mostly on fancy bags of all sizes and shapes, each a beautiful creation with its own story to tell. Awesome work! Does he have a website or Etsy site?